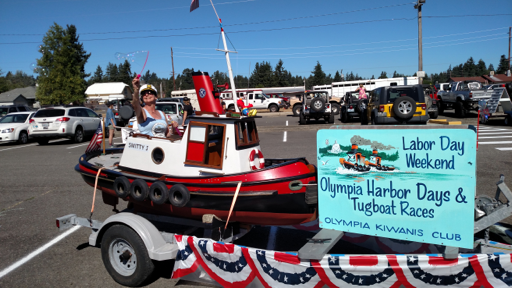 Tug of the Month: SMITTY J and KATHY M — Olympia Harbor Days | 3-Day Festival Featuring the World's Largest Vintage Tugboat Races! 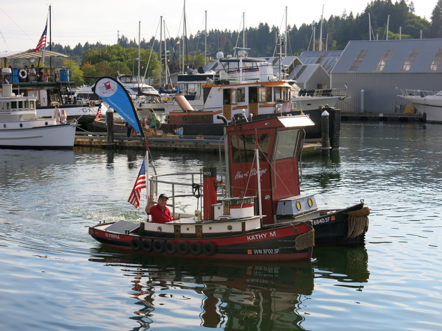 Bob Peck has long been a pillar of the Olympia Harbor Days (OHD) enterprise, and his scale or mini tugs have been a prominent feature in recent years. Two are completed, and a third is under construction. SMITTY J, the first boat built (2003), was named for Bob’s first wife, the late “Smitty June” Peck. She is 10 feet in length, with a 13 horsepower gas engine, and is an East Coast harbor tug design from the 1920-30s. The cabins had to be built larger than scale to accommodate the engine. Stability at the dock was also a consideration. As Peck says in his excellent boat-builder’s memoir, Tugboats and the Sea (2017), the hull is built wider than in a full scale boat and the dead rise (the slope of the underwater sides to the central keel) is almost flat. 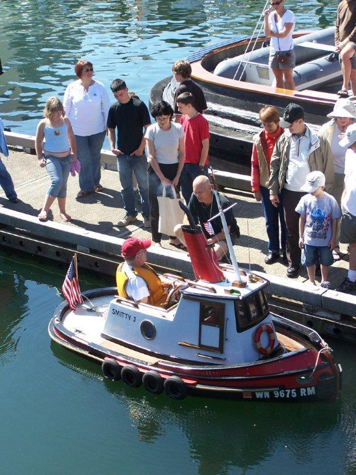 Peck donated SMITTY J to the Olympia Kiwanis Club in 2012 to be used promotionally in support of Olympia Harbor Days when responsibility for the festival and races was transferred from South Sound Maritime Heritage Association (SSMHA) to the Kiwanis. 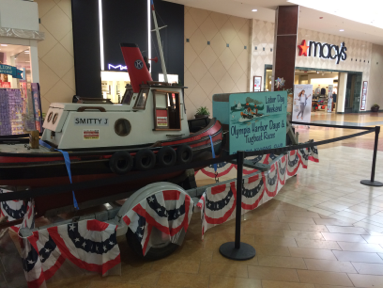 She is now a “shore-side” boat, appearing at the Capital Mall, displayed on Percival Landing during OHD, and also appears in regional festivals and parades, often towed by Kiwanian and former SSMHA president Dave Peeler. Many of SMITTY J’s features are identical to a full-scale tug’s. The aft underwater hull slopes up smoothly from just forward of the propeller to the water line at the stern, giving the boat additional buoyancy aft, an important towing feature, as the propeller wash moves directly up under the stern, rather than discharging to the sides. His third scale tug, the JANE B, is under construction. Slightly larger than KATHY M she is named for Peck’s daughter-in-law. Her design model is that of a Great Lakes harbor tug of the 1950s. DR. ROBERT D. PECK, scholar/boat builder, has owned, built or remodeled more than 20 vessels in his lifetime. It seems a highly unusual practice for a self-described ‘egg-head.” Peck has been president of three independent universities and held leadership positions in both a state and national educational council. He holds doctoral degrees in Religion and Philosophy, and his forte’ is the history of ideas. It seems that this particular academic preparation has drawn him to a sensitivity concerning the mystery of the seas, with his boat building born of that mysterious feeling. Peck loves the creative nature of the building craft, the love of and knowledge of the wood, which wood works best for which hull segment, and the grace and beauty of the boat design, the sheer, for instance, that graceful curve of the deck line from fore to aft. He delights in puzzling over the origins of arcane sea traditions; the gilded eagle atop the deck houses of Eastern tugs, the reason for the narrow pilot houses (for economy, the skipper was also the helmsmen, and in New York harbor he had to be able to hold the wheel while reaching through the pilot house window for the note from the dispatcher of the location of his next tow). Nor parse beyond its clear delight? But is the inner rhyme of life. As a varsity oarsman at the University of Washington, I sat for four years at the feet of another boat-builder/philosopher, George Yeoman Pocock. Peck’s observations remind me greatly of Pocock’s wisdom. Peck’s OHD involvement has been central to the race and festival’s success. As a long time president of SSMHA, and still on its board, as a race judge, the traditional master of ceremonies for the Skippers Dinner, and race master advisor, no OHD weekend would be complete without him. 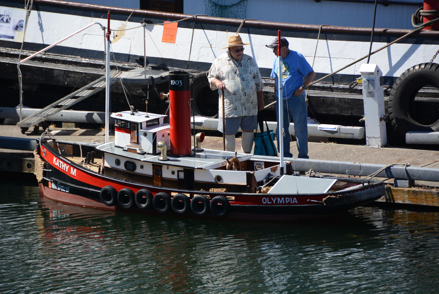 Peck is currently helping shaping the future of SSMHA’s Tug Parthia Project, and with historian Chuck Fowler, and restoration boss Gary Larson, we hope soon to display the Parthia ashore as a maritime heritage feature of the Olympia waterfront. Peck will be in the middle of this effort. Sources: Interviews with Bob Peck. Tugboats and the Sea by Robert D. Peck, 2017. 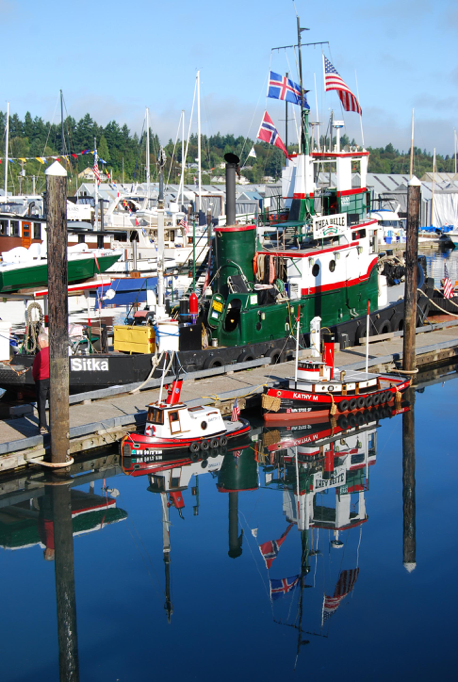 Tugboats on Puget Sound by Chuck Fowler and Capt. Mark Freeman, Arcadia Publishing, 2009. West Coast Workboats, by Archie Satterfield, Sasquatch Books, 1992.Tugboats Illustrated by Paul Farrell, W.W. Norton, 2016.